Geoff Nunberg wows me every time with his "Fresh Air" language commentaries -- they go down so smoothly on the air, yet they're complex and meaty essays, well worth a second listen (or read). In the latest one, Geoff not only explains the difference between the "under God" in the Gettsyburg Address and the "under God" in the Pledge of Allegiance, but introduces the lovely term hapax legomenon to the public radio audience. Read it or hear it here. Today's Globe column is about the recent word ban at Chicago's WGN-AM. I didn't go into the differences between spoken and written English, but thinking about how "banned words" for the oral and written media might differ did prompt a moment of what may be insight. I've always wondered why so many editors dislike some for "about," as in "some 300 marchers waved signs." (The OED's earliest citation for the usage is from Boethius, in 888, and there's no record of its being disparaged) But when I saw some on the WGN list, I thought, well, it's not all that common in spoken English; maybe editors have decided that since they see it only in print, it must be a journalistic tic. I don't hear it that way at all. I agree that "fled on foot" is journalese (though I don't despise it), but "some 300" has had a long and flourishing career in non-journalistic prose, and really shouldn't be stigmatized. On another subject entirely, I was pleased that none of my editors boggled at my use of "ill-wishing," which I think of as more British than American English. I used it as a simple opposite of "well-wishing," but in the book where I first encountered it in the '70s -- Fay Weldon's novel "Down Among the Women" -- it's used in the more specific sense "put a curse on": "Now Emma has ill-wished the hens." But now I'm wondering, is ill-wishing is actually more common in BrE? It's not all that old, it turns out; the verb isn't recorded until the 19th century. The OED's cites are British, but Google Books has an example from an 1862 issue of the Boston Review: "The neighbors, sore perplexed at the strange movements of the child, came to the conclusion that some one must have 'overlooked' or 'ill-wished' her." Maybe Lynneguist can enlighten us; but even if not, you should be reading her blog, including today's discussion of dishwashing and teakettle-heating in the British and American dialects. I know that hospital gowns hereabouts are familiarly known as "johnnies" -- and if any garment calls out for a familiar name, it's this one -- but until I heard from Sara B., looking for more information, I had no idea this word was a New England regionalism. But the Boston part is true, says the Historical Dictionary of American Slang: Johnny is "Common in Boston area hospitals from ca1900, but apparently unknown elsewhere." Johnny is of course a very common word, both as a name and as a slang term: Among the senses HDAS gives it are a young fellow, long underwear, an Army recruit, a fool, a servant, a Chinese man, and a policeman, and that's before you start on the Johnny Rebs and stage-door Johnnies and Johnny collars. So I searched for "hospital johnnies," which turns up in Google News cites starting in 1950, almost always in New England newspapers, though one 1953 mention is in the St. Petersburg Times. I would expect johnny to have spread a bit, if only among hospital staff, given the number of doctors exported by New England medical schools. But if there's a record of its coinage (and I wouldn't bet on it), someone else will have to dig it up. If you have a clue I can pass on to Sara B., please share it. 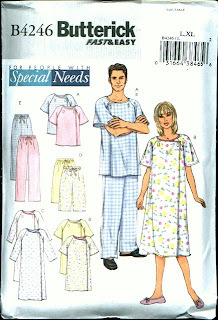 And yes, aren't you glad to know you can sew your own hospital johnny? The pattern is for sale at Butterick.com and here. The tape was originally called duck tape, for its water-repelling properties. (Duck ...water ... get it?) And, as the story goes, the fabric used to make the tape was called cotton duck. Soldiers soon discovered that the tape was incredibly useful in repairing just about anything that needed repair, from jeeps to planes to tents to boots. As time went on, "duck" morphed into "duct" because of its use in the postwar building industry to help connect … you guessed it … ductwork for heating and air conditioning. But I still couldn't find a shred of evidence for this, so I asked the J&J librarian, Margaret Gurowitz, what it was based on. Her reply, which arrived after the column went to press, says, essentially, that there is no evidence -- it's just company folklore. Unfortunately, I don't have any additional information on the transition from "duck" to "duct" tape. ... Because duct tape was invented as a wartime product for the military during World War II, there was no product launch and publicity of the kind that would happen with most products. ... The story about it being originally called "duck" has been passed down verbally here, and it also can be found on the many websites devoted to duct tape. Since it was originally developed as a waterproof tape to keep ammunition cases dry, and it was said to have been made using cotton duck fabric, the story of the origin of its name does make sense. In fact, I found evidence that J&J had developed silver duct tape (and used it on ductwork) by 1938, well before it would have been needed for ammunition cases. So if anything, the story is shakier than it was last time I looked. ** As I conclude in the column, there was a fabric tape (duck tape), and later there was a sticky tape (duct tape), but "explanations" of their connection are still just guesswork. *Behind a paywall at the Globe, but reproduced here. **Update: Dammit, Michael Quinion, whose eyes are clearly better than mine, points out that the pub date of this article is not 1938 but 1958. Doesn't affect the conclusion, but puts a serious dent in my satisfaction. However, a 1958 date is evidence of a different sort: The article shows men taping ductwork and describes the tape as silver colored, but does not call it "duct tape" (or "duck tape" either). In the late 1990s, a manifesto falsely attributed to Kurt Vonnegut made the rounds of e-mail boxes. It came to be known as "Wear Sunscreen" — and even spawned a hit music video from movie director Baz Luhrmann. A similar, but more vicious, manifesto is now going viral. It was penned by firebrand NYU professor Scott Galloway to a student who arrived to his class an hour late. We give this latest diatribe the Luhrmann-like musical treatment. Update, 7:30 p.m.: It's even stranger than I thought; the report mentions that the original "essay" came from the Chicago Tribune, but it does indeed leave out the author's name (while mentioning Vonnegut and Luhrman!). Bizarre. Does NGD need a name change? The spirit was willing: For National Grammar Day, it was marching with Mark Liberman and the Modal Auxiliary Corps in their assault on the Dark Tower of official peevology. But the flesh was weak, laid low by a nasty bronchitis as grimly persistent as the over/more than myth. Between coughing fits, though, I roused myself to enjoy the NGD observances of my fitter compatriots. Neal Whitman, for example, argued that singular they is here to stay, so why not adopt a sensible set of rules for it? "Everyone did their best" -- fine. "If someone was pregnant I would be sympathetic to them" -- silly. (The piece is at Visual Thesaurus, subscription $19.95 a year, 14-day free trial available.) And Gabe Doyle used the occasion to debunk 10 usage beliefs (about hopefully, which/that, healthy/healthful, etc.) that thoroughly deserve debunking. All this makes me think that the problems with National Grammar Day may be baked into its very name. Most usage complaints are not about grammar at all; shouldn't an observance dedicated to spreading enlightenment start out by making this clear? Or should NGD simply be renamed, more accurately, National (Get Over Your) Peeve Day?